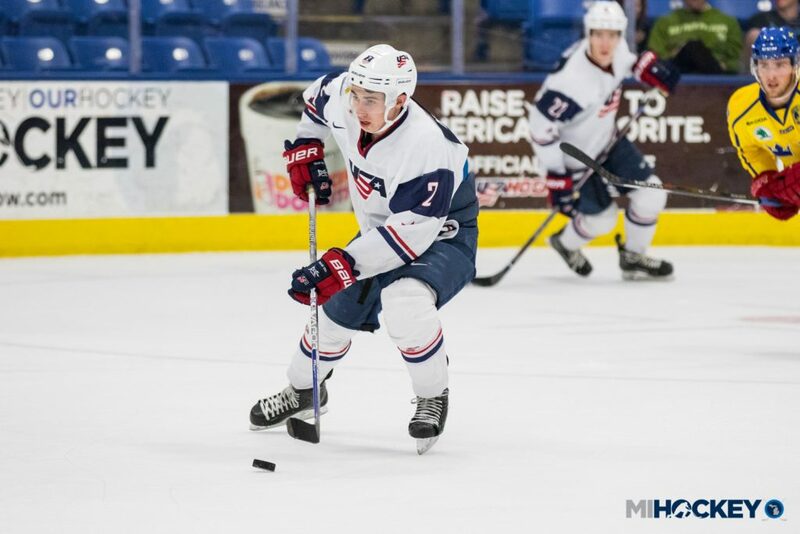 PLYMOUTH – During an interview session at the World Junior Summer Showcase, a reporter asked Quinn Hughes if he was surprised to receive an invitation to the prestigious camp. Hughes responded with, “why, should I have been?” and a slight laugh. The same way he is with the puck as he flies through the neutral zone or dances around a defender just inside the blue line. When the puck drops on the 2017-18 season, University of Michigan hockey fans will be treated to a skill-set the folks at USA Hockey Arena grew accustomed to the past two seasons. Hughes skates like the wind, and he has the puck skills to match. That’s why he was one of only three players on the U.S. 42-man camp invite list who are 2018 draft-eligible prospects (the others being Oliver Wahlstrom and Brady Tkachuk). The 5-foot-9 defenseman said that after the first few shifts, the nerves went away. It doesn’t hurt that he’s skating at the rink he’s called home for the past two seasons. Dealing with adversity is a common theme for players who progress through the National Team Development Program. In Year 1, the players get used to USHL competition as a roster full of the youngest possible birth-years in the top junior league in the country. In Year 2, it’s a substantial amount of NCAA games and international competition, concluding with the U18 World Championship (which the U.S. won this past spring). For this week’s camp, Hughes has been trying to impress on and off the ice. The coaches have certainly noticed his skating abilities – “yeah, I think I’ve always been a pretty good skater” – and his comfort level in all three zones. The fact that he grew up playing forward certainly didn’t hurt. He credits his hockey family for his passion for the game; they certainly know their way around a rink. His father, Jim, played for Providence College and his mom, Ellen, played for New Hampshire, while his uncle, Marty, played for Boston College. Hughes’ cousin, Teddy Doherty, was a captain at BC, and Hughes’ younger brother, Jack, is slated to be another star for the NTDP this fall. He’s got another little brother in the pipeline, too – Luke, a defenseman, will be suiting up for Little Caesars. After the family was stationed in Toronto for many years – Jim Hughes was working for the Maple Leafs – the hockey family’s officially moving to Metro Detroit. He’s not worried about how his brother, Jack, will handle the bright lights; the middle Hughes brother is a very highly-touted prospect. The family will be able to make trips to Ann Arbor to see Quinn star for the Wolverines’ blue line. He’s focused on improving himself both on and off the ice. He knows it’s a big year for him with the 2018 NHL Draft looming, too. Hughes acknowledged that the World Junior Summer Showcase is an opportunity to improve his draft stock, with NHL team representatives filling the stands in Plymouth. And while he’s disappointed that he won’t be able to play for Red Berenson, he looks forward to getting to know Mel Pearson.